What is wonderful about the Alton Mill Arts Centre in Alton is being able to meet the artists whose work is on display either in the Centre or/and in their own studios. A person can meet them, talk to them about their work and, in many cases, attend their workshops. Sunday afternoon seemed a good time to get to know at least a few of the artists who have their studios located upstairs at the Mill. 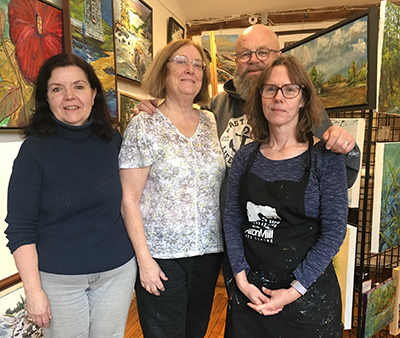 So, we popped into the office to say hello to Pearl Schachter, manager of marketing, and went with her upstairs to meet Karen Brown, the most recently installed of the artists, and the new co-owner of The Hive, the Encaustic studio. “Encaustic is an ancient beeswax based paint which is applied and heated to create rich layers of unique depth and luminosity,” says the studio’s hand out card. Encaustic artist Karen Brown was happy to elaborate about the art form and why she and Kim Kool, another encaustic artist, have taken over the studio. Naturally, they have their our own original paintings for sale too. Relatively new to the Alton Mill is Sherry Park, portrait artist in oils, primarily, while she also does watercolour paintings of nature and flowers. In a studio big enough for three artists, Lynden Cowan, Robert Chisholm and Joanne Lomas display their work and create more. It is, at once, a busy and a calm place to visit. Ms. Cowan has a list of commendations and awards that have seen her work displayed in London, England with the Viva Canada and, in association with the Circle Foundation, to Lyons in France, which pleased her very much. She and eight other artists have formed their own group, Southern Ontario Visual Artists (SOVA), doing four shows a year only. Beside those, they each participate in other shows throughout the year. Four of them travelled together to the Maritimes to enjoy the inspiration other scenes could offer. Ms. Cowen’s style loves the detail of nature, which she reflects in imposing paintings, with boldness and rich colours, not straying particularly from nature’s own choices. Her paintings offer a challenge to the viewer to see into her detail and, perhaps, wish to be there. Mr. Chisholm’s, SOVA, works are primarily long landscapes, tending to big paintings and he was working on one while we were there. It was, as he told us, by the rail junction at the Tim Hortons on the west end of Orangeville. Across the hall is Margaret Sarah Pardy, another Alton Mill member of SOVA, who discovered a few years ago the art of black painting, as it were. In her case, she buys hard boards, painted stark white and, then, covered in black, perfect for scratching out art. Fabulous. She has a tool with five little needles or pins bonded together and installed in a small holder, which she uses, holding it this way and that, to make different strokes and angles. Some of her pictures are straight white on black; some, she involves colour into the white, once she has etched out the details of the figures. Wildlife dominates Ms. Pardy’s work and she travels the country to observe them, especially in animal sanctuaries, and continues to engage in workshops with eminent Canadian wildlife artists. One of her paintings is going to be installed in the Ontario parliament buildings at Queen’s Park next year. She is quite excited about that. This year, she was also accepted into the Ontario Society of Artists. Our next studio-of-call was the office/studio of Margi Taylor-Self, the longest-term artist’s studio at the Alton Mill, at 15 years. Ms. Taylor-Self loves the Alton Mill. Ms. Taylor-Self handles the leasing side of the Mill’s affairs and is looking for the right person to lease a corner studio; could be someone who does visual art that is not painting. The main floor of the Alton Mill is given over to artisans and galleries. For longevity at the Mill, after Margi Taylor-Self, Anne Marie Warburton with her Gallery Gemma has been there the longest. Ms. Warburton’s space is a glamorous jewellery gallery, offering her work and that of selected jewellery designers from around the world. Ms. Warburton decided mid-career to re-invent herself. She abandoned her sales work and went back to school to study making jewellery at a very high end with precious metals and fine gems; she went back to school to also study jewellery as a business. For this Christmas season, Gallery Gemma is open Monday, Christmas Eve, using the smaller entrance into the Alton Mill, as the rest of the Mill will be closed that day. The new Rare Threads gallery, as it were, a beautiful space running adjacent to Gallery Gemma, will also be open Christmas Eve. Over this coming weekend, as every weekend, Alton Mill, Headwaters Gallery, Noodle Gallery, the artists’ studios upstairs and Mark Grice downstairs are all open from today, Thursday, through to Sunday.